But this place may have changed my mind! Stopped here for a bit to eat while walking through downtown Haleiwa and it was well worth it! Super cheap (about $7 a dog) and tons and tons of different combinations. First, pick your dog – either polish sausage or veggie. I had the veggie and you couldn’t tell the difference from a meat hot dog. The polish sausage got great review from others members of my family as well. Then pick your bun (all fresh baked and oh-so-soft!). Their specialty is the taro bacon bun, which got a disgusted face from the youngest at the table, but one bite and he was hooked. They toast the buns from the inside out which was a really nice touch – hot all the way through and crunchy where it was toasted. Then pick spiciness level a la roasted garlic lemon sauce and any of their fresh made salsas. The mango and pineapple salsas received great reviews from my family. Don’t forget a glass of their lemonade- you can watch them make it right in front of you, and on a hot day it is the perfect treat! Definitely stop by when you are near. We stopped at Haleiwa and saw many food trucks, this one was selling hot dogs and some drinks. We ordered vegetarian hot dogs and it was awesome. We ordered more after having one. 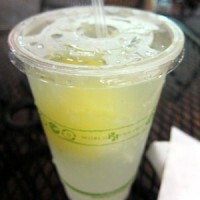 We also tried Lemonade with Lilikoi flavor and it was sooo refreshing. They have many options and flavors. Worth stopping and grabbing one. As residents of Hawaii, we’ve been fans of Hula Dog since the early beginnings in Kauai with a lemonade stand. It’s a given that we stop by Hula Dog when in Honolulu, and we have referred many friends who visit to enjoy a one-of-a-kind experience throughout the years. Comments are all positive, and now their trips to Honolulu include a HULA Dog. HULA DOG sauces are homemade, custom mustards dreamy, and the fresh buns and quality of meat outstanding. This isn’t a regular hot dog steamed with a store-bought bun, and their lunch special of a bag of chips, fresh squeezed lemonade, and a Hula Dog is one of the best lunch deals in Honolulu. We read about hula dogs in the north shore map and decided to swing by to try it. The woman working there was super nice and really friendly and helpful with our order. She walked us through all the flavors and told us we really couldn’t go wrong with any of the sauces. After we got our dogs she came over to check on us and chat more. It’s a really unique hot dog experience and the buns are amazing with a perfect hot dog hole in the middle. Definitely get the bacon taro bun – it’s really fun and super Hawaiian. We loved the flavored mustard as well! And the mango and pineapple relish were good too (they were the only two we tried). I’d definitely hit up this truck again!! The dogs go for about $7/each and are pretty large and gourmet. CJ and AUD are foodies ! Another thing to mention, they have flavored fresh squeezed lemonade. I forgot all the flavors but I got Lilikoi lemonade (CJ got papaya) and we both LOVED our choices! I can’t tell you enough how good this place is… Just go and try it for yourself. I will never love a regular “main-land” hot dog the same again because of Hula Dog! relish and a slightly hotter sauce than mine. After a few minuets my dog was ready and I started to eat it when I was called up the the stand to get my wife’s. they admitted they made a mistake and gave her the same relish and hot sauce than mine and were making another on. They also gave me the one they messed up k. Which was basically 2 of the one I ordered. Bonus! I too, the other mistaken dog and gave it to my wife which she ate half and waited for here. So basically we got lucky with 3 dogs because of a small mistake. Great customer service!! This is a true hidden gem but so worth to find. I thought my dog was great and I loved the roll. The roll was a little bigger thank I waged, but I just tore so, off and ate the rest. Not a big deal. OMG I wish I lived in Hawaii so I could get a Hula Dog EVERYDAY OF MY LIFE. It was amazing! I tried a combo that was a little sweeter: Taro/Bacon bun, medium spicy sauce, pineapple relish, lilikoi mustard and a polish dog. Had a lemonade to wash it down (asked for a little less sugar since it was pretty sweet after tasting my friend’s). Absolutely delicious and I will be coming back and getting another. Their bread is delicious, and unlike regular hot dogs, it is an uncut bun, which while toasting they make a hole for the hot dog. They have veggie hot dogs for those of you who don’t eat meat, and their bread selections are AMAZING… bacon taro bread, honey wheat!! !You pick one of their secret garlic lemon sauce, from mild all the way to super hot (habanero, or jalapeno etc)… you also pick a relish, out of a million delicious options such as pineapple or mango!!!! Lastly you pick another topping, like guava mustard or whatever. You won’t be spilling any of your topping because they are neatly inside the bread. You just gotta remember to push up the toppings when you are in the middle of your hot dog, so they don’t all stay at the bottom for your last bites!Their shaved ice takes a while, because they shave the ice in a machine when ordered, making it super fluffy and delicious, not to mention GIANT…and all their ingredients are super fresh and healthy. LOVE this place!!!!!!!!!!!!!!!!!!!!!!!!!!! Can’t leave Hawaii without having one! I had been here back when it was Hula Dog and I could not wait to get back here on our latest visit! We were recommended this place by a couple we met on a diving trip. While I’m not much of a hot dog person we checked it out anyway and was glad I did. This place has simply the best dogs I’ve ever had. About 2 bites into mine I was thinking of going back for a second but was too full. They have many unusual sauces to put on the dogs that are fantastic. This place was my favorite in Waikiki and they have so many toppings to customize that the combos are endless. They have great combos they recommend (Mango relish + liliquoi mustard or pineapple relish with guava mustard) and plenty of other choices I haven’t tried yet. They vary from delicious sounding (starfruit or coconut relish) to off the wall (banana). Not many places make a great veggie dog but this place was fantastic for that as well. It was like a jumbo smart dog-good texture. You don’t notice a bunch of the flavor though because of all the sauces. Just let them know you’re getting veggie ahead of time so they can add it to the grill. Okay this place is SOOO neat!!!! I love the concept of heating the bread on that stick so that the insides are super crispy. All of the sauces are pretty good and the workers were so nice about telling us about the different combinations for sauces. We heard about this place because they gave us samples while we were walking on Kuhio and we HAD to come back for some! 3 kinds of breads: taro bacon, pumpkin wheat, and original. With either a hot dog or polish. And TONSSS of sauce varieties. A buddy of mine got me a Hula Dog t-shirt about 4 years ago when he and his wife were in Kauai and he told me it was the BEST EVER hot dog he had ever ate. My wife and I, along with our friends were just in Kauai this past week, August 11-17, and the very first place we went was to Hula Dog and OMG !!!! that was the best hot dog I could ever eat. We actually ate there several more times before we had to leave.Would you PLEASE !! hurry and open one up in Southern California. It would go over real big here, I’m sure. How Much Do We Love your Hawaiian Dog ? Then rented a car drove to hotel near the Marina. Changed out of our wrinkled clothes. If that not a fan we do not know what is. We will be back! PS Maybe the best shave ice in Hawaii too – That coconut cream topping rocks! We travelled to Waikiki in the last part of April 2009. My niece had seen your Hula Dog featured on the Food Network and had done some internet research it. She insisted that we try the Hula Dog . Am I glad she did! All of our party agreed that the Hula Dog was a unique blend of island flavors and very tasty. I just looked at your web site and was very excited to see that you have a new store in Waikiki. I will be going to Oahu in July 2008 and was hoping you would have your sauces and relishes available for sale by then? How much would the 9 oz bottles be? I’m planning to buy tons of them so I can enjoy it throughout the year and to show all my friends and relatives how awesome your products are. I was hooked the first time I tasted your Hula Dog in 2006. A friend even bought a bunch to take with him while we were still traveling to 2 other islands (yes, he kept them in the fridge as we traveled!) Thanks and I look forward to munching on the best hotdogs in the world! We were recently in Honolulu and were hoping to be able to find your Hula Dog location there after seeing you on the Travel Channel. The first thing we did after settling into our place was to hunt it down. Much to our delight, it was right across the street from our place. We took full advantage of its location eating there seven time in the eight nights we stayed there and the food was much better than we hoped it would be. Hawaii to us has so many wonderful things to remember but Hula Dog will always comes to mind when it comes to eating on our trip. Not only was the food great but JoAnn was the biggest delight to meet. I hope you know what a wonderful person you have running your store on Ohau. Even when we weren’t eating there, we could not walk by without saying hello and being greeted from her by name with her wonderful smile. The rest of her workers all hold the same wonderful service and attitude she does. Not a time goes by that someone asks us about Hawaii and we go on and on about Hula Dog . I love to travel and most of all I love to eat. 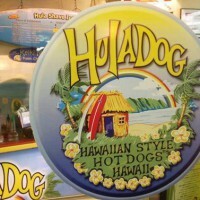 Hula Dog was one of the best eating experiences I’ve ever had on a vacation because of your food and employees. THANK YOU!